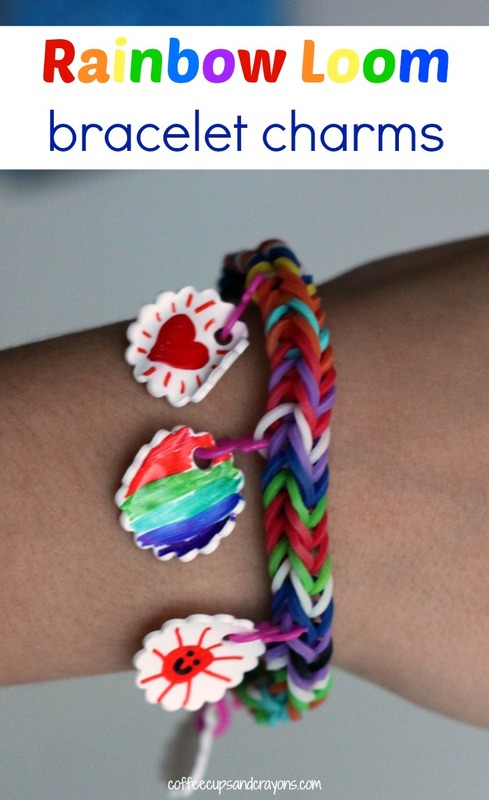 My kids love to make Rainbow Loom bracelets! We even came up with Rainbow Loom valentines and I love to see the kids so excited about creating. To keep the fun going we decided to try to make some charms to go on the band bracelets! 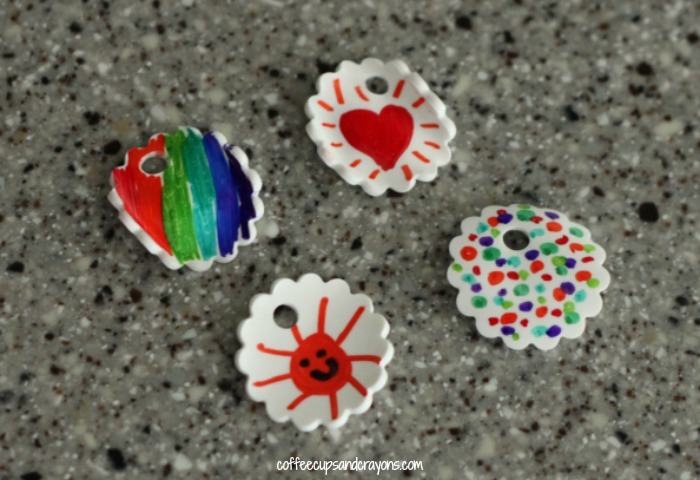 Use a hole punch or scissors to cut out shapes from the Shrinky Dink paper. (We used a 1.5 inch punch for the ones in the photos.) Then use a regular sized hole punch to punch holes into the shapes where we were going to attach them to the bracelets. You want to make sure you punch the holes before you bake them! Then let the kids decorate the charms with the markers and bake them according to the package instructions. We baked ours at 325 degrees for a minute or two. I put on the oven light so we could watch them shrink and curl up and then flatten back out. Once they started to uncurl I took them out of the oven. You can use a wooden spoon to flatten them a little bit if you need to while they are still warm. When the charms are cooled connect them to a band bracelet with an S clip or string. We used some clips that came with a package of bands from the Dollar Store, but if you don’t have any that will work just tie them on with string. They look so cute don’t they? I love this!!! How adorable. I just saw these at the craft store the other day…you are so ahead of the trend! Cute! Jana Chanley I made you one for Valentine’s day. I’ll bring it tomorrow. It’s a ladybug of course. 🙂 swapmeet tomorrow?? Maybe? Super cute, Megan! 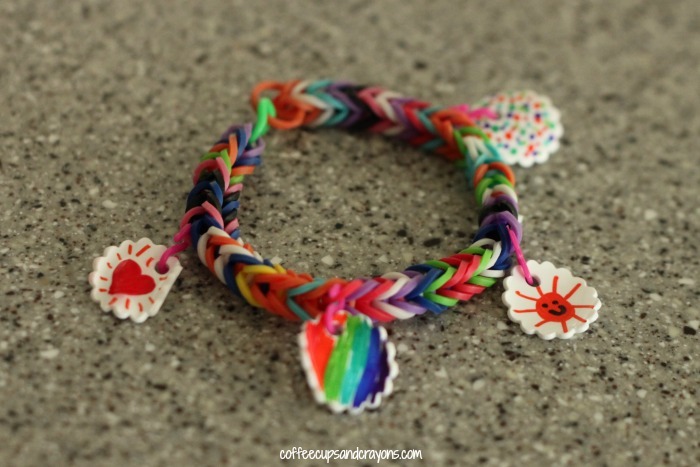 I grew up with shrinky dinks and making friendship bracelets like these. It’s like the best of both worlds lol. Ha! Me too! I think I am more excited about these than the kids!